"I am a Trainer. It's how I define myself"
what training programs do we offer? We offer Train the Trainer and Master Trainer certification programs in all major cities in india. The Train the Trainer program at Indian Leadership Academy is a 3-day certification program which provides you with complete guidance and assistance necessary to become a successful trainer. We not only provide guidance on HOW TO BECOME A TRAINER but also work with you along in your training journey. The Train the Trainer model has been designed by professionals who have more than 2 decades of learning and development industry experience. This includes proven models and nextgen training techniques. Our Train the Trainer Certification Program offers a blueprint on how to achieve success as a trainer. Develop and deliver impactful content. Create a strong online presence through personal branding. Host your own public workshops. Familiarize yourself with concepts which are currently booming in the training market like NLP, VR Training, Outbound Learning. This is a frequently asked question. After the completion of the Train The Trainer Certification Program, a lot of trainers find it quite challenging in deciding how to proceed further. We offer the next level of training after the completion of Train The Trainer Program that is the “Master Trainer Certification Program”. The fine line between a good trainer and a great trainer is MASTERY. The Master Trainer Program is a 4-day program and is the next level of the Train The Trainer Certification Program. Corporate training has always been the grit test of any trainer. This program has been developed by our master trainers after careful evaluation of training standards nationally and internationally. Why should you attend our Master Trainer Certification Program? Be proficient in advanced content development models. Be able to develop your own online courses. Have access to tried and tested psychological tools for efficient assessment of the audience. Be aware of the know how’s of corporate training which includes proposal writing, budget negotiation etc. Be able to successfully host your own public workshops. 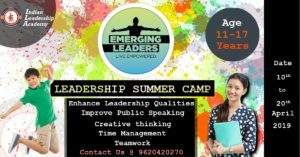 Indian leadership Academy offers a 6 months mentoring program for aspiring trainers as well as trainers who want to to elevate themselves to the next level. The mentoring programs are well structured programs where you are assigned a mentor who is a Master Trainer and has got substantial Credibility as a Trainer. Its mostly a one on one set up where the mentor closely works with you to sharpen your training delivery, content development and sales skills. The mentorship programs are conducted throughout the year, that way people don’t have to wait for long to get started. 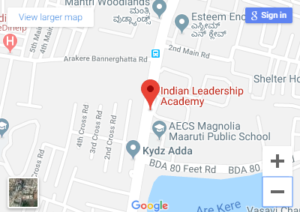 After the mentorship Programs, Indian leadership academy provides at least one paid training opportunity so that one gets first hand experience and real time exposure in the training industry. We also offer Tailor made Programs for specific topics for the trainers. This is mostly for corporates. However if there is a group of individuals looking for specific topics for trainers, we can also cater to such requirements. LIVE EXPERIENCE IN TRAINING:- In the Train the Trainer Certification Program we give the participants a chance to give a live training session. This will be evaluated by our master trainers and fellow participants. Appropriate feedback and guidance will be given to the participants. POST PROGRAM SUPPORT:- We all know that, ‘Learning starts outside the classrooms’. Keeping that in mind the training model incorporates guidance by the Master Trainers even after the program. Up to a month after completion of the Train the Trainer Certification Program or Master Trainer program the candidates can book an appointment and have a one on one session with our Master Trainers for further guidance through their journey. COST EFFECTIVENESS:- The cost of the Train the Trainer Certification Program is one of the most economically feasible programs in the market. VALUE ADDS:- After the completion of the Train the Trainer Certification Program and the Master Trainer Program you will not only be provided with a certificate from Indian Leadership Academy but also you will be provided with a Trainer Starter kit which includes all the necessary blueprint and the templates necessary for a trainer. We at Indian Leadership Academy believe in providing the highest quality of Train The Trainer, Master Trainer Certification Programs and is always there to guide you through your journey. We do Train The Trainer workshops in all major cities in India. Do reach out to us to talk to our trainers and be a part of our Trainer certification programs. Aspiring trainers, Corporate Executives looking for a career switch, Housewives, Students, Teachers, HR Executives, Entrepreneurs, Managers, Coaches, Motivational Speakers. Q1) What is the criteria to attend our - 1) Train the Trainer Certification Program and 2) Master Trainer Certification Program? Ans → (a) The main criteria for attending the Train the Trainer workshop is, proficiency in English and a clear vision of what you want to achieve as a trainer. This can be attended by freshers who have no training experience but are really passionate about training. (b) The Master Trainer Program is the advanced training module, which is designed for people who are already trainers and for those who have some on-stage experience. Q2) Does the Train the Trainer Certification Program cater to the needs of technical trainers also? Ans → Yes, our training module is designed by experts taking into consideration both behavioral and technical trainers. Q3) Is there any way for a participant to be directly associated with the Indian Leadership Academy? Ans → Yes, in every batch the best performing participant will be chosen as a freelance trainer for Indian Leadership Academy. This is an initiative taken by us to ensure the talent and potential in a trainer doesn’t go unnoticed. Kaushik Mahapatra is one of India’s leading Leadership Trainers. He is NLP Trainer, Corporate Speaker, Executive Coach and Team Building Expert. He has more than 20 years of corporate experience. His key areas are Foundations of Leadership, Leadership Essentials for Managers, Stress management, Effective presentation skills, Design thinking, Corporate Strategy, Outbound Learning. He was trained in NLP by one of the founders of NLP John Grinder himself. He has conducted NLP Trainings in UK and Singapore and Leadership coaching and team building courses in Melbourne. Self-assessment – Analyse your Strength & weakness as a Trainer. Different training modes – Classroom training, Online training, Outbound Learning. Building rapport with our audience. Training Need Analysis, Learning Management System. Quick brainstorming – Real world challenges as a trainer. How to build content Tailor made content to cater to the need of the organization. Self‐ Development tools for a Trainer. VR based learning, Online training. Art of Handling tough questions. How to handle training for mid management and Managers. Popular Training programs in the Market. Ready to start training kit.